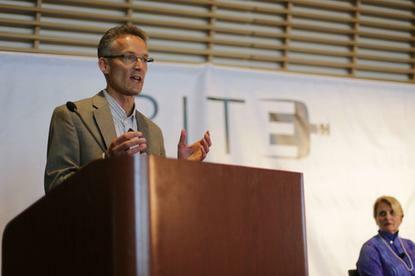 Michiel Bakker, director of Google's Global Food Program, spoke on June 5, 2015, at the BiteSV conference in Santa Clara, California. If your image of the Google cafeteria is a bunch of portly coders tucking into steak and lobster every night, think again: Silicon Valley's cream of the crop is going on a diet. To the list of perks you're missing out on at the famous workers' paradise, you can now add healthier food. But don't worry, the planet wins, too. For the last year and a half, Google's food department has been on a mission to cut down on meat. "A more balanced, plant-centric diet is good for the environment and is good for your health," said Michiel Bakker, director of the Global Food Program at Google. "So if we can move more people to eat less meat and to enjoy more vegetables, the rest will follow." Bakker laid out this vision on Friday at BiteSV, a conference in Santa Clara, California, that brought together people from the food and technology industries. But though the event featured the likes of Hampton Creek Foods, which is developing a fully plant-based line of products through analysis of overlooked plant species, he said Google is taking a gradual approach. The first step is educating its "culinarians" about ways to substitute vegetables for meat without making Google's pampered employees feel like they're missing out. For example, there's a way to grill cauliflower that gives it some of the same rich flavor found in grilled meats, Bakker said. Google's also turning to regional cuisines from places like India, Southeast Asia, Latin America and the Mediterranean that use less meat than traditional Western diets. "It's better just to do and not talk about it," he said. And there's still some meat on the menu. Google's food department has always been conscientious about what it served, but it kicked off this plant-based effort about 18 months ago in connection with Menus of Change, a healthy food initiative of the Culinary Institute of America and Harvard's School of Public Health. Started at Google's headquarters in Mountain View, California, it's been implemented to varying degrees across the Global Food Program's operations around the world, which include more than 70 restaurants serving more than 75,000 people. Eventually, the company hopes to get its employees interested in food and how it relates to health and the environment. "If we engage our work force, they will go out and actually use their networks as well to make a difference," Bakker said.